You know what they say – if it ain’t broke, don’t fix it. The thing is, how do you really know whether a particular thing is broken or not when the wheels of imagination and innovation have stopped spinning a long, long time ago? Do you think that there are far better alternatives to the modern day handcuffs, perhaps one that is energy based like how we have seen in some science fiction movies? 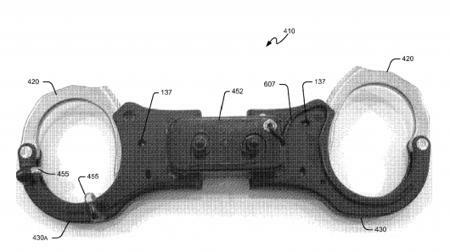 Of course, what we are asking for is not for security companies or the research arm of the military to come up with a new kind of handcuff that “reinvents the wheel”, but rather, an improvement on the current design. Basically, handcuffs are steel restraints at the moment, but the future might just usher in a high-tech pair that delivers electric shocks. Yes sir, watch prisoners toe the line even more if U.S. Patent Application 20120298119, Scottsdale Inventions, LLC of Paradise Valley, Arizona, were to roll off the production lines of a factory somewhere in the world. Basically, this pair of high-tech handcuffs will work like an electric eel, delivering electrical shocks to prisoners via an incorporated Taser-like system that is connected to wireless controls and sophisticated sensors. You could say that the Scottsdale cuffs are somewhat like a combination of invisible fences and training collars that see action when training dogs. The canine versions do provide a mild joy buzzer of a shock, but the cuffs that is meant to be worn by prisoners could actually deliver a shock that is powerful enough to immobilize a prisoner. They will be built based on the principle of the Taser, which relies on electrodes to administer high-voltage, low amperage shocks that are capable of disrupting a person’s voluntary nervous system. Well, this particular idea could eventually be extended to see action in an ankle cuff, restraining belt, straitjacket, harness, facial restraint, helmet or neck collar, which means being a prisoner is no longer any fun – not that it was in the first place anyway, and it will certainly make those bad boys behind bars have second thoughts about throwing their weight around. Wow! What a great tool for campus cops. They could cuff, electrocute, and pepperspray in one easy process. Teach those pathetic losers, paying huge sums of borrowed money for a worthless education, who is really the boss here. Right republicans? LOL.